It was a typical morning. The rush of getting myself ready for work, “discussing” getting dressed with the Munchkin, “discussing” eating breakfast, “discussing” cleaning teeth, “discussing” putting on shoes. Running late… again! Knowing the boss would give me one of “those” looks as I turned up at my desk – never saying anything, just looking. Over one arm, I threw my handbag, my laptop bag and Munchkin’s daycare bag. Under the other arm, I hoisted a kicking, screaming 2 year old – and headed out the door. Halfway down the front stairs my heel caught. Bags, Munchkin and I went A over T down 10 stairs. Fortunately, nobody was hurt (no more than a massive bruise on my leg anyway), but as I sat on a step, tears pouring, the Munchkin cuddling up to me trying to comfort me, it hit me. This whole Supermum thing was a myth, and I had fallen for it. I had been so sure I could pull off Supermum – after all, I’d always been able to do anything I set my mind to. My dream promotion came up at work the same week I fell pregnant. My much hoped for pregnancy took second priority to job interviews, an interstate transfer, buying a new home, settling into an exciting new role. Three months’ maternity leave seemed like plenty – especially at the time. I hated being home. I was bored and lonely and absolutely determined not to watch ANY daytime TV. I just wanted to go back to work – it was only 4 days a week. By the Munchkin’s first birthday, I was back full-time+ in a big corporate marketing job. Six months later I returned to part-time study as well. Looking back, I can see how I ended up as a “fallen” Supermum, but like a frog boiling slowly to death, I didn’t realise it at the time. My work was suffering, my marriage was full of narkiness, my child’s behaviour was out of control and I was falling asleep over my textbooks. Something… no, EVERYTHING had to change! It worked surprisingly quickly! In less than 12 months, my studies were complete, I had a generous redundancy payout in my bank account and my new business was underway. For the first time in his little life, I had time to really get to know my Munchkin – we played, we laughed, we shared stories, we went on adventures together. He still went to daycare and my Mum’s so I could get some work done, but it was for fewer days and shorter hours. Life slowed down… and it was good! Of course, I’m not telling you this so that you will quit your job and start your own business (although if that’s what you’d really love to do, I’ll wholeheartedly support you)! What I really want to talk about is “slowing down”. All kids can read emotional undercurrents… sensitive kids especially so. What they can’t do so well is process them. Hence the multiple “discussions” the Munchkin and I were having every morning while I was working my corporate job. Over time, I have come to understand that it is a sure sign that life is getting a bit out of control if the Munchkin’s behaviour starts going “off” – things like aggression, rudeness or temper tantrums creep back into our life (in our house it is unlikely that food additives and sleep deprivation are the problem, but these may also be triggers for such behaviours – more on that later). Of course, slowing down is not just good for your kids’ emotional lives. 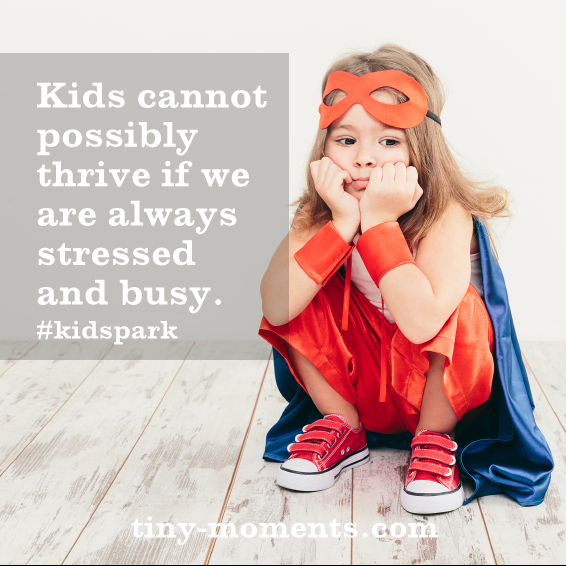 It also leaves them with more time to play and just be. It’s good for you too! How to slow down your life right now! Put in some systems that help you have a calmer start to the day. If they’re old enough, teach your kids how to make their own breakfast, so you can shower and get ready in peace. Better still, teach them how to make their own lunches too! If you think a morning routine visual chart will help, use one. Make sure you have a place for shoes, bags etc and that even if you have to do the picking up yourself at night, you’ll know where they are every morning. Ban TV in the mornings and put on an audio book or music instead – works like a charm in our house! Take your full allocation of lunch break – every day! Go for a walk in a nearby park, meet a friend you don’t normally see, sit in your car and meditate or read a book. By not taking your lunch break, you are either telling your workplace that you are so dedicated to your job that you can be loaded up with even more work, or that you are not very efficient. Neither are impressions you want to make! Put in a request for flexible working arrangements. You’ll need to word it so it makes for a good business case, but having the option to work at home one day a week, or doing shorter days in the office (and working in the evening) could make a huge difference to your family life. Companies are obliged by law to consider a reasonable request (they don’t have to grant it though), so it’s definitely worth looking into. Check out the book Career Mums by Allison Tait and Kate Sykes, for some down-to-earth advice on negotiating flexible working agreements. Get a cleaner and/or a gardener. They’re worth their weight in gold, and it’s really not that much gold for how much better you’ll feel. Look at home delivery options for your weekly basics. It may be just an organic fruit and veg box, or it could be your whole supermarket shop, but it will help free up your weekends to spend time with the family. Do that yoga class, get your nails done (OK, dads might not be so into this one! ), have a massage, soak in a bath, read a book. Pop it in your calendar and treat it like any other appointment. Kids are hard on marriages, and you need time together to reconnect. Find a good, reliable sitter that you can call on regularly, or send them to grandparents or friends for a sleep over.